We produce stunning custom vinyl graphics, sticker printing and lettering at our in house studio to ensure a fast turnaround and high quality finish. Our vinyl printing includes computer cut vehicle graphics, logos, signs and much more. They are the perfect material to easily display your branding, making them effective anywhere that has a smooth and flat surface. We have been producing computer cut vinyl lettering, vinyl signs and vinyl graphics for over 30 years, browse our range below and get an instant price. Pre spaced self adhesive lettering is still the ideal way to create DIY sings. You can create your own sign by using our free online tool. Type the words, choose the font, size and colour, and place your order. The lettering will be sent to you pre-space and ready to apply to any dry stable surface. For more information on vinyl lettering application - watch our video. Simple logos can also be cut from self adhesive vinyl. 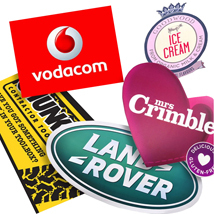 Although you could use a printed sticker cut logos will last longer. A sheet of self adhesive vinyl is loaded into a computer-controlled vinyl cutter. The vinyl cutter uses a knife to cut through the top layer of material. 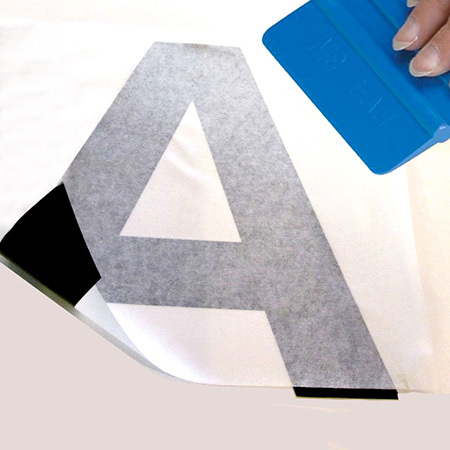 This method means that the resulting logo is cut out in a single colour. If multiple colours are involved then these have to be cut separately and layed up by hand. Computer cut vinyl graphics are a low cost effective method of promoting your business. Ideal for boat graphics, vinyl vehicle graphics, outdoor signs, office signs, shop window displays. The finished product is sent to you as a complete sign. You remove the backing material and smooth it down onto your sign surface. For logos we need a vector file you can learn about vectors here What Is Vector Art? Vinyl printing is used to create multicoloured signs and personalised stickers. A sheet of white self adhesive vinyl is put into a printer and your image is printed onto the material. More or less the same as your desktop printer but much larger and using long life durable inks. Once your file has been printed onto self adhesive vinyl it can then be cut to shape. Large format digital PRINTING onto self adhesive vinyl is used to create eye catching displays. Ideal for hoardings, building wraps, retail signage, sticker printing, vehicle graphics, outdoor signs and much more.